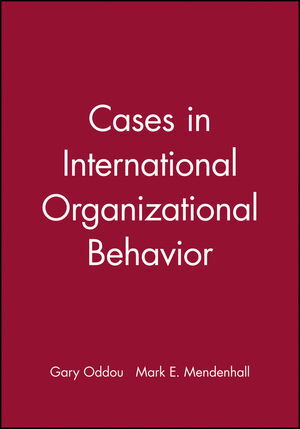 I>Cases in International Organizational Behavior is an ideal supplement to organizational behavior and principles of management courses. Gary Oddou is Professor of Management at San José State University. He has consulted and published widely in the area of international management and international human resource management. Mark Mendenhall is the J. Burton Frierson Chair of Excellence in business leadership at the University of Tennessee, Chattanooga. He is past president of the International Division of the Academy of Management, and has published numerous articles in the area of international human resource management. 1. Rough Times At Nomura: Allen Bird, Ron Dalbell, Richard Madigan, Jim Noble, and Prema Venkat. 2. Chiba International, Inc: Nina Hatvany and Vladimir Pucik. 3. Euro Disneyland: Stewart Black, Hal B. Gregersen and Sonali Krishna. 4. Computex Corporation: Martin Hilb. 5. Ellen Morre in Bahrain: Gail Ellement, Martha Maznevski, and Henry W. Lane. 6. TDK de Mexico: Manab Thakur. 7. IKEA: P. Grol, C. Schoch and CPA. 8. Olivia Francis: Mark Mendenhall. 9. How Much Sleaze is too Much? : Asbjorn Olsand. 10. Chicago Medical Supplies Corporation: Explaining Sales in India: Lynne H. Rosansky. 11. Colgate Palmolive in Post-Apartheid South Africa: David T. Bealy. 12. Leadership of TQM in Autocratic Settings: Asbjorn Olsand. 13. Chang Koh Metal Ptd. Ltd, in China: Thomas Begley. 14. Rus Wane Equipment: Joint Venture in Russia (A) and (B) and Note on Russia's History and Recent Business Environment: Stanislaav V. Shekshnia and Sheila M. Puffer. 15. The Donor Services Department: Joyce Osland. 16. Nissan Italiz, SPA: Ayako Asakura and Susan Schneider. 17. Creating a Learning Organization Through HRM: A German-Czeck Joint Venture (A): Dianne J. Cyr and Susan C. Schneider. 18. Technogrid Group and A/O Navicon: J. Stewart Black and Marat Shinkarev. * Diverse collection representative of issues arising in diverse countries and cultures such as: Russia, Japan, French-speaking Africa, Republic of Czech, the People's Republic of China, Central America, France, India, Bahrain, Sweden, South Africa, Mexico, Italy, Germany, and the United States. * Orientation toward decision making. * Cases are multi-functional in nature. * Instructor's Manual including case teaching notes available on disk.